Next review LeafFilter North - These people schedule jobs, get signed contracts then on install day they call with lack of enough materials. Want to reschedule job! Sep 05, 2016 Hi David, We are sorry that your experience with our product has been less than satisfactory. 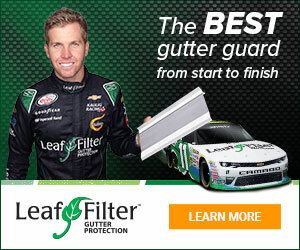 LeafFilter offers a 100% money back no-clog guarantee. Please contact our service support team at 800-749-4566 so that we can determine a custom solution for your unique situation. They use youtube videos and advertisements that lead homeowners to believe the product does something that it positively does NOT do. It doesn't work in rain, it doesn't work in snow. It doesn't work with ice, and they need to be shut down. They have somehow prevented google reviews and yelp reviews and we are left to leave comments on sites like this. When I asked for a refund, the refused. They have been to my house over 5 times and still product does not do what they say it does. Horrible customer service and the product is even worse. DO NOT USE LEAF FILTER! I didn't like: Bad sales practices, Worthless warantee, Bad service, Rude customer service after sale. Review #608416 is a subjective opinion of User608416. I wish there were a way to shut them down. I was advised to start a class action suit but don't really know how. They lie, their customer service is awful, their product does NOT do what it's advertised to do. Everything from the start has been a nightmare. The actual salesman who first came to the house was very nice. Everything since then has either just been terrible or an outright lie. So we're currently suing. Wish more people would.